At Mobile Truck Rental, our friendly team help make your truck rental experience a great deal easier for you. To begin with, we don’t require you to needlessly waste your hard-earned money or spend any unnecessary time visiting our rental agency to collect your rental vehicle. And we definitely don’t demand you to fulfil the arduous task of returning the vehicle to us once you’ve finished using it. With Mobile Truck Rental, your rental truck is delivered directly to your location, at a time that suits you. Similarly, when it comes time to hand your vehicle back to us, we’ll come out and retrieve it from you at a nominated address, anywhere in Australia. We have quick approval process that guarantees your rental truck will be available to you as soon as you need it. For an outstanding deal on truck rental throughout Melbourne, call us now on 1300 799 317. Whether you require a rental truck for domestic reasons or commercial purposes, our fleet of Pantech trucks are an ever-dependable workhorse that enables you to focus on what matters to you most. If you demand an ultra-reliable transport truck that can capably cope with anything you can throw at it, our range of hire vehicles will never leave you disappointed. The most common use for our hire trucks is DIY removal. If you require the services of an indestructible removal truck to help haul your personal belongings from one destination to another, transfer big and bulky items such as furniture, or perhaps relocate the complete contents of your small business, are trucks are an excellent solution for you. Be sure to read our guide on safely loading and unloading heavy equipment. Whatever your reason for renting a truck, the team at Mobile Truck Rental will ensure that the entire hire process is as hassle-free as possible. 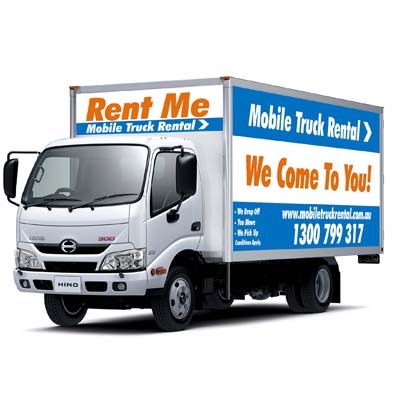 At Mobile Truck Rental, we make Melbourne truck rental affordable. Our vehicles are all immaculately clean, maintained and serviced on a frequent basis and come fully equipped with all the gadgets you need to perform your transport duties in total comfort. Competitive rates with no hidden charges. First Class Customer Service – our customer service team are able to answer any enquiries you may have concerning our truck rentals. We can supply you with 3 tonne Pantech trucks at a time and place that best suits you and can develop a personalised hire package that accommodates your specific needs. If you can’t decide on which truck is best suited to your requirements, simply get in touch with our knowledgeable support staff who will gladly discuss it with you and make sure you choose a vehicle that is best for you. We have a long history of providing five star hire services to our clients. Please take the time to browse our testimonials section and read what they have to say about their experiences with Mobile Truck Rental. Clean, Reliable and Regularly Serviced Vehicles – when you rent a truck, reliability is everything. Our range of late model Pantech trucks are bulletproof work vehicles that ensure all your tasks are able to be completed on time and with minimal hassle. All vehicles are maintained to the highest standards of operability and are serviced on a regular basis by trade-certified mechanics. All of our trucks are subjected to strict testing procedures that evaluate the performance and reliability of the vehcile. No truck is ever made available for hire until it has passed all of our quality assurance tests. First Class Vehicles at Affordable Prices – have a glance at our truck rental rates to quickly discover how much money you stand to save yourself by hiring a Pantech truck. At Mobile Truck Rental, you have the ability to select the size of truck you require to get the job done with maximum efficiency and the flexibility to rent the truck for as long as you desire. There is complete transparency in our service pricing and you will never be slugged with hidden charges. Perfect for Domestic or Commercial Purposes – our rental trucks provide ample storage space, able to transport the entire contents of a 3 bedroom unit in a single trip. Although larger than regular passenger vehicles, our rental trucks are just as easy to drive, providing a high level of comfort and manoeuvrability. Be sure to read our driving tips guide on how to safely operate your new vehicle. Moving house or relocating your business can be an arduous affair, but our vehicles are purpose built to excel at these exact tasks. We do the collecting for you. We drop your hire truck off at your specified address and we collect it from you once you’ve finished using it. It’s that simple. For a free quote concerning removal truck hire throughout Melbourne, contact the team at Mobile Truck Rental now!